The Sparks started as a group when some young boys got together to make music. As was the case in the rest of the Netherlands and other countries as well. Twan van Well, a real Shadows fan together with Piet Hoebers and Ben Fransen, completed with drummer Loetje Vollenberg, started playing together. First they had only instrumental covers from the Shadows later when Ben Hermsen joined the group other non-instrumental songs were added to the repertoire. They became very succesful in the south of Holland and the German region just across the border. Also they won several talent scouting contests and even made a demo-record for the Polygram studios but it was never released. A year or so later the group changed a bit. Drummer Loetje Vollenberg was replaced by Frans Derks and Jan Soberje joined as piano/organ player. Still a year or so later Hay Hoebers joined the band when Ben Franssen had to join the army. The group stopped as a band which played every week because people started studying, got married or started a business. Still they came together on special occasions to do a performance. The Sparks really started their second career after the first Beatnight in Horst. Six groups came together in a kind of reunion concert and played in a sold out Merthal for 1700 enthousiast people. The Sparks were one of the groups performing here and got so many reactions that they decided to play on. This has been going on for some 12 years now. In those years the Sparks released three CD's. Drummer Frans Derks decided to stop and was replaced by Bert Voesten. Bassplayer Ben Franssen had to stop for health reasons and was replaced by Peter Verberne. The rest of the group remained the same as in the early years. In September 2002 the Sparks performed at a Volvo meeting in Utrecht where about 20.000 visitors were present during the two days. The reactions there were very positive. A rock and roll dance group from Eindhoven danced to the music. In October the group performed with the English Rockabilly group The Firebirds at a festival in Zeilberg. In November there was a beatnight in de Bilt where the group played together with "The Brillos" from the Hague. on 14/15 November the Sparks travelled to Liverpool to perform at the famous Cavern Club. About 50 regular fans travelled with the group . The trip was a great success and the audiences were very positive about the Sparks. Now in the year 2004 the Sparks performed at the sixties festival in Venray on April 17th with a perfect show. Also present at the festival were the VEGE band from Holland and The Jets from England. In 2005 the Sparks are going to record another CD which will be released at the end of 2005 or the beginning of 2006. Still enjoying playing their music and having a good time. Everything stopped for a while due to the illness of singer Ben including the plans for another CD. May 2005: The Sparks start performing again with a stand-in singer: Piet van de Wouw. October 2005: Singer Ben dies after a long illness. We will all miss his friendship and his voice. December 2005: The Sparks perform for the first time with the new singer in Horst. 2006 The Sparks are on the road again and still performing, doing what they like doing: making real live music, no tapes, no discs, every sound produced by their instruments is played by them. The Sparks perform with their two new singers, John and Bennie Hermsen, sons of their former singer, Ben Hermsen. 2007 has the potential to become a very good year for The Sparks. Everyone is very enthusiastic. The two new singers fit in like a glove and we'll see what the future brings in terms of another CD maybe. In 2008 the new CD was recorded and released in August. The Sparks are proud of the result and hope many CDs will find their way to the fans. Towards the end of 2008 the Sparks took part in a competition called "The clash of the coverbands". From this competition a single live single was produced and people of the Netrherlands could vote for it. With their single "Born on the bayou" the Sparks ended in the top 200 list on the second position. Only one band in the Netherlands got more votes. In 2009 The Sparks continued to play. There were no changes in the band and it doesn't look as if there are going to be any changes in the near future. 2010 and 2010 were succesful years for the Sparks as there were many performances and good audiences. on 24th of November 2012 the Sparks celebrated their 50 years as a band with the release of a new mini CD (8 songs) and a sold out performance and coverage by television. A half hour special was broadcasted on television and there were 2 one hour specials on radio. In 2014 the Sparks played again on several occasions. Look at the performances list for details. 2015 and 2016 still proved that the Sparks are still popular. They play about once or twice a month throughout the year. The Sparks went to England in 2017.
on April 21-23 The Sparks played two performances in Folkestone during a "double Dutch"performance at the Grand Burnstin hotel. Together with another Dutch sixties band they filledthe weekend with music from the sixties and seventies. 160 fans travelled with us and stayed at the hotel for three days. During the day we visited Canterbury and Folkestone of course. All in all a great experience. In 2018 on 26 and 27 April the Sparks will play in England again. 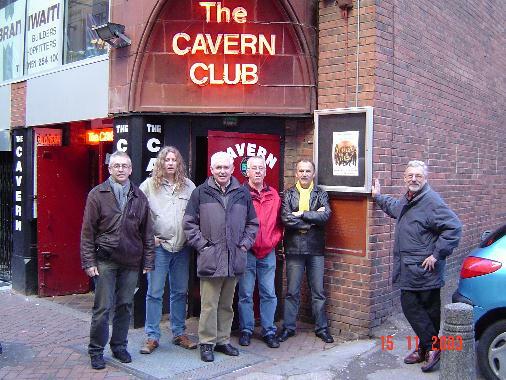 This time in Liverpool at the Cavern Club in Matthew street. The Sparks played here before in 2003 so it's familiar ground for them. A number of fans will also travel to Liverpool as support.